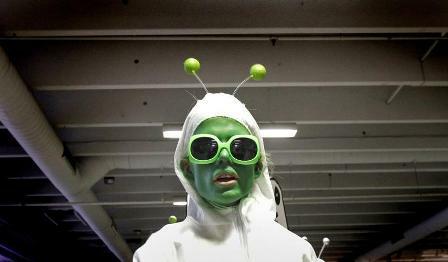 Global trade surplus: proof of alien life? Mankind has spent centuries looking for signs of alien life. Now a French graduate student appears to have found evidence in an unusual spot: the ledgers of the world’s customs offices. Gabriel Zucman, a Ph.D. candidate at the Paris School of Economics, has crunched together data for exports and imports from around the world. In theory, the two should cancel each other out. Yet Zucman’s estimates show that in 2007 the world’s current account was in surplus by $400 billion. That’s impossible, unless aliens are buying iPhones and iPads. Sadly for believers in extraterrestrial life, there is a more mundane explanation. Zucman thinks the global trade surplus probably stems from errors in the accounts of developing countries. Another possibility is that trade may be disguising capital flows. In most countries, exporters and importers are usually allowed to move money around, but investors do not always have the same freedom. This is particularly true of China, where economists have long suspected companies of using trade to circumvent the country’s capital controls. Zucman’s data shows that the world began running a trade surplus in 2004, when speculative capital looking to profit from a revaluation of the yuan started entering China. The recent divergence between what China records as its exports to Hong Kong, and what Hong Kong customs officials count as imports from China, suggests mainland companies are once again padding out exports. The mismatch is not new. In a 1978 paper, “Is there trade with other planets?” economist Jeffrey Frankel showed that global trade statistics had a tendency to record a deficit. In the 1990s, the deficit – as measured in 2008 dollars – widened to an average $70 billion. But with China’s 2001 entry into the World Trade Organization, the balance swung to a surplus, which kept growing. At $298 billion, the surplus in 2008 – the last year for which Zucman has data – was smaller than in the previous year, but still significant. The figures are another reminder to be suspicious of national trade data. But they also have real-world consequences. Capital and current accounts are linked, so if developing nations’ trade surpluses appear larger than they actually are, then the amounts they owe foreigners are being underestimated. That unrecorded debt could be significant – unless it’s intergalactic. The world has run a current account surplus since 2004, according to research by Gabriel Zucman, a Paris School of Economics Ph.D. candidate. This fictitious surplus, which arises when exports recorded by one country do not end up being recorded as an import in any other country’s trade statistics stems “most likely from errors in developing countries’ accounts,” Zucman notes. In 2007, the world’s “surplus” widened to $403 billion, before narrowing to $298 billion in 2008, Zucman’s analysis shows.